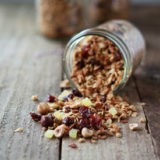 Tart cherries, hazelnuts, salty pistachios, and zingly little bits of candied ginger make this crunchy, easy granola sing. Put it in mason jars and give it away as Christmas gifts! Or keep it all for yourself. Either way, it's all good. How’s it going with your gift-buying this year? Aside from the play kitchen Santa is attempting to make for our little one (think old free entertainment center plus Pinterest-fueled aspirations), I’ve had my gift-buying wrapped up for weeks now. I don’t really feel like I have it together, though. I mean, for one, there are still a gazillion things to do. Christmas came fast this year. And all that punctual Christmas gift buying really means is that I end up buying more stuff. Gosh, darling daughter, that officially-too-small hat looks like it’s squeezing your head! 30 seconds shopping upstairs in the guest-bedroom-turned gift-hiding room, and I emerge with the adorable hat and matching mittens that I picked up at a Black Friday super-sale. It’s not like I can’t put a hat and mittens in her stocking, I mean, that would be blasphemy. So, on actual Christmas morning, hopefully she will also like the Hello Kitty topper and gloves I picked up as a replacement. And the bonus star-studded purple trapper hat that she was totally eyeing the other day at Target. Though … she may need one of those in advance, too. It could snow! I’ve actually done a pretty good job of adhering to the want, need, wear, read rule (thank you again, Pinterest) – but it doesn’t really help curb excess gift-buying when the Toy Story DVD that filled the “want” category came out early during a weak moment. Though I do think she’ll love the fancy fire truck she’s getting in its stead. Receiving, I guess, is much simpler than giving. And one of my very favorite gifts to receive – premature or otherwise – are of the edible variety. 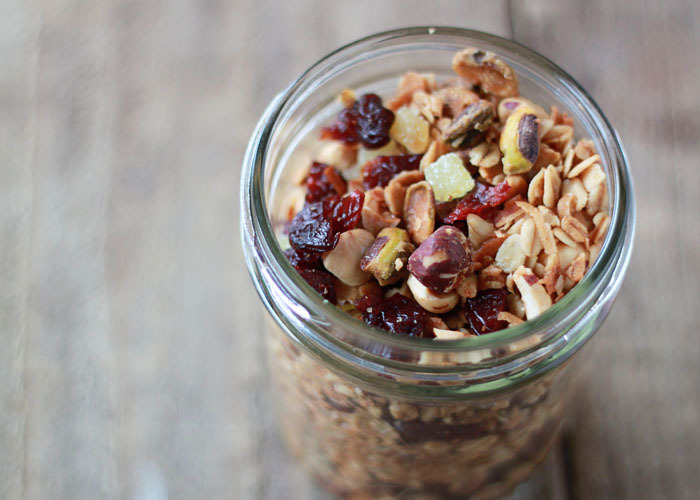 And this homemade granola with hazelnuts, pistachios, cherries, and candied ginger would fit the bill just fine. 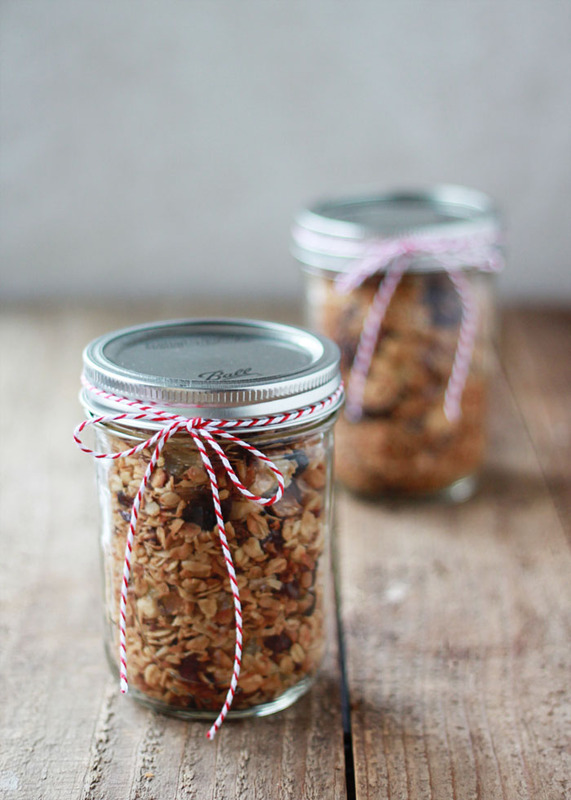 I love giving homemade granola as a little Christmas gift. I think it’s a welcome reprieve from cookies and candy (don’t get me wrong, I love cookies and candy, but I think you know what I mean). It’s perfect because it makes a great grab-and-go, heathy(ish) snack or breakfast during this frenzied time of year. I am particularly obsessed with this creation, though. It started out as simply cherry and hazelnut granola, but then I just had to add some salty, roasted pistachios. But the last-minute-addition that really makes it is the candied ginger. 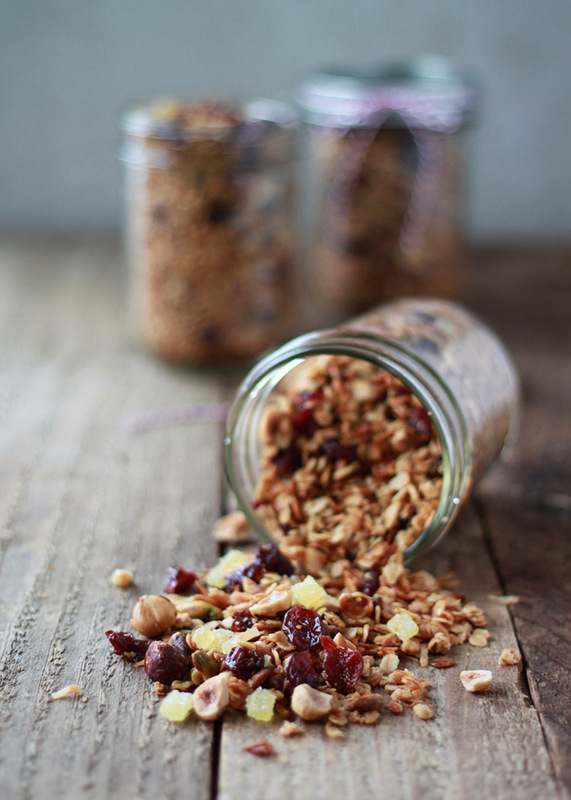 The candied ginger has pretty much clinched this one as my Christmas go-to granola, forevermore. This recipe is smaller-batch than many granola recipes – it results in about 6 cups, filling three 16-ounce mason jars. So be sure to double or triple it if you’re making a bunch for gifts. Just be sure you have the cookie sheets to support the operation! Each batch will take up about one cookie sheet. Or, you know what? Forget all of that, and just make a batch and keep it all for yourself. Consider it a delicious little respite from the whirlwind that is holiday gifting. In a large bowl, toss together the rolled oats, pistachios, hazelnuts, and coconut. Pour the maple syrup mixture over the oats and nuts, and with a wooden spoon, toss until evenly coated. Line a large rimmed cookie sheet with parchment paper or a silicone mat. Spread granola on cookie sheets and bake for 30-40 minutes, stirring every 10 minutes, until the granola turns golden brown. Let cool, then mix in the dried fruit. Store in an airtight container (it should keep for up to a month at room temperature). 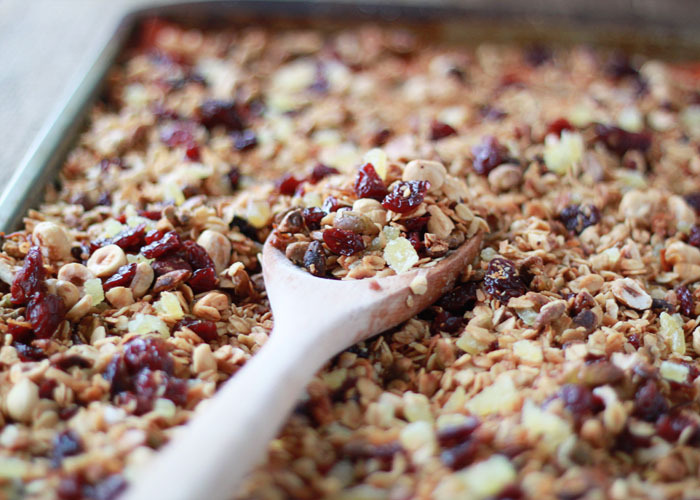 I love giving homemade food gifts for Christmas and this granola is perfect. The flavours are so festive too with the pistachios and dried cherries and ginger! I am not on my A game this year. Christmas really has come too fast. Thanks for the lovely gift idea. 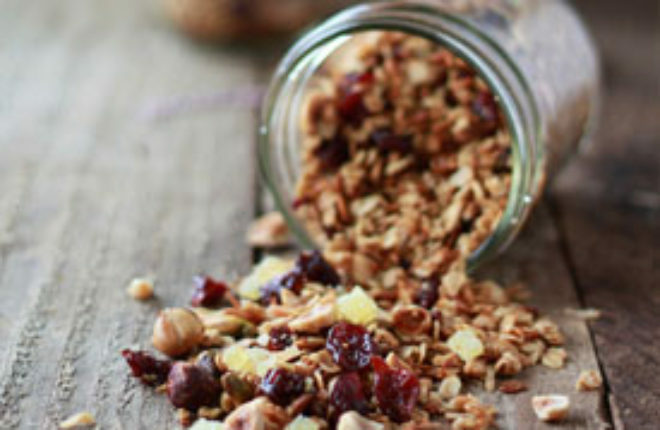 You can’t go wrong with homemade granola! love the flavor combinations here. I’m totally behind on my Christmas gifts – I know what I want, but don’t know what to buy anyone else!